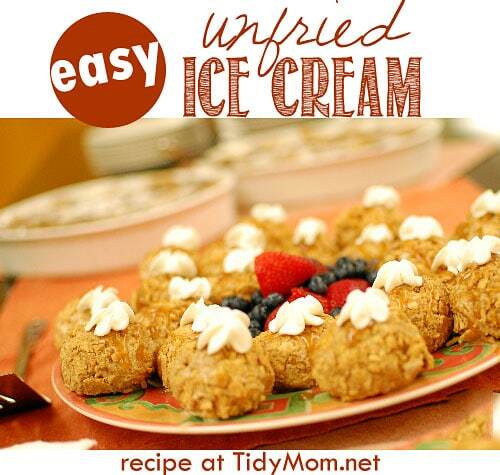 A fun way to serve ice cream, this unfried ice cream recipe is super easy, fast and delicious. Prepare it ahead of time and keep in the freezer to serve at your next party! If your kids are like mine……..you don’t usually have to twist their arm to get them to help make dessert. Tell them it involves rolling ice cream into balls with their hands……and giggles are sure to follow!! It’s been years since I had fried ice cream, but I remember how much I loved it!! Good news is, I love this unfried ice cream just as much! Although different (and definitely not fried) it’s an easy way to prepare a yummy dessert with a delicious crunchy topping. Serve it topped with whipped cream, drizzled with honey, and with a little fresh fruit for effect. This unfried ice cream is easy as pie to make and oh so good! Arrange cereal on aluminum-foil-lined baking sheet and bake 5 minutes or until crunchy; cool completely. Shape Ice Cream into 16 1/4 cup balls, then freeze 1 hour or until firm. Evenly coat Ice Cream with cereal, then freeze until ready to serve. Arrange Ice Cream on plate and drizzle with caramel ice cream topping. Garnish with whipped cream. Variations: You could also try this with Honey Nut Cherrios, Corn Flakes , Golden Grahams, or just experiment on your own! One bite…….and you will think this is really fried ice cream!! *You could also try this with Honey Nut Cherrios, Corn Flakes , Golden Grahams, or just experiment on your own! It may not be “fried” but this sure is an easy way to prepare a yummy dessert with a delicious crunchy topping. Perfect for a Cinco de Mayo celebration! Oh wow, Cheryl! Fried ice cream is one of my favorite tex-mex desserts, and I never would have thought of this (probably) healthier alternative. So much easier too! Yum! They look great! I love your “Kids in the Kitchen” List you have on the posts!! Thanks for sharing! I’ve never seen these before but they sure look like a fun treat! We love to make this, only we top ours with my Dad’s honey. Delish! One of these days, I’ve GOT to try fried ice cream! I make “fried” ice cream pretty much just like this but I put cinnamon and a little sugar with the cereal. and I’ve always made big balls and place it on a fried and then dipped in cinn/sugar tortilla. garnish with whip cream and honey, chocolate, or carmel. It is awesome! But I really like the idea of these little ones. EASY 🙂 Thanks for the new idea on an old fave of mine. oh my goodness, what an excellent idea! Sounds absolutely delicious. I’m having a mexican fiesta themed party for my sister this weekend! I think I’ll make these for part of the dessert. Yum! YUM!! I’ve never had fried ice cream, and it sounds a bit scary to make. This sounds MUCH easier. Oh, I love it! It looks so easy and YUMMY!!! Oooh! Looks so good I’m definitely bookmarking this one! Thanks a bunch for sharing. I love this idea! I’m really excited to try this! My kiddos will be so happy! They love to help.me. you always.post recipes.that work very well for me 🙂 I’m hooked.on your cake mix.fix. its really been a lifesaver for me! What an easy and fun idea! Just think of all the different possibilities here. Love this idea… what a fun way to get the kiddos in the kitchen! These sound like so much fun to make! What a great treat! What a great idea!! We introduced our girls to the “real deal” fried ice cream just a couple months ago – they were in love! I used to love cinnamon toast crunch! 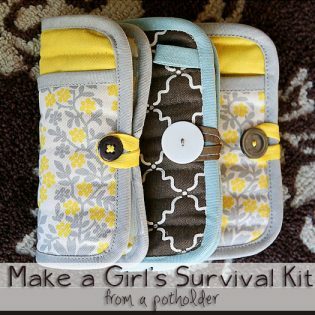 This is such a great idea, and so easy too. Fried ice cream without the frying. I love it!!!! oh my gosh, what a treat this is!! I love the crunchy coating. I have to save this for a night with the kids, seriously, this is great! love it! What a great idea! I will be trying this soon! Those look so good, and sound fun and easy!!! Wonderful idea!! Great kid recipe. But seriously I might have them do all the work and then enjoy them all by myself. Ilove recipe!!! omg. slurp. is all i can say. i totally missed this post. what a great idea! love cinnamon, carmel & vanilla together. always a good thing! my oldest & i could totally do this recipe together. it’s a good one! Love it! I grew up eating Fried Ice Cream, can’t wait to try this with the kids! this is really a neat idea!! sounds good toooooo~! Pingback: The best “unfried ice cream” ever!